The Black Cat (Also known as the Magician Cat.). In 1958, a Kentucky (USA) breeder deliberately bred a black American shorthair and a sable-brown Burmese in an effort to creat a domestic cat that resembled the wild Panther. This novel combination successfully produced offspring that resembled the Black Leopard of India, The Bombay name, taken from the Indian city of Bombay (now Mumbai), honours the native country of the wild cousin. Despite its distinct and beautiful appearance the Bombay's international acceptance has grown slowly. It always displays a thick, shiny, solid black coat; no other colours or patterns are permitted, The eyes shine in a coppery or golden shade. The Black Cat in France is known as the Matagot, or Magician Cat. The fortunate family that takes the cat into its house receives the gift of good luck as a result. On the peninsulla of Brittany, in the northwest of France, there is a similar legend called the Chat D'Argent, or Money Cat. This feline is believed to serve nine owners at a time. Throughout the rest of the world, with the exception of South America, the black cat is almost universally reviled as a harbinger of bad luck, an omen of the dark side. Ireland, always a treasure trove of mythology, appointed the black cat as a helpmate of healers, and, at the same time, a witch's familiar. This shows the pagan influence of sun and moon cycles on the human psyche. The black cat, a carrier of magic, was a representative of darkness. But, owing to fur that could also turn into moonglow, or silver, the black cat was given a dual identity. Furthermore, black was the byproduct of fire; fire, to the ancients was a thing of beauty, utility, and great power. All these aspects were, and are, present in the black cat. 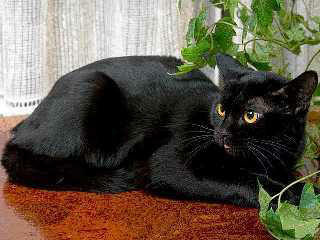 The Bombay is considered a quiet, watchful cat who loves affection. This can be said of any feline. But the Bombay is one who, when things are going her way, purrs loudly enough to be heard in the next room. Bombays enjoy the indoors perhaps more than the outdoors, and they are noted for not liking any intrusive noises. This a well balanced, muscular cat with a deep black coat. Rounded and wide head with a short tapered muzzle. Round, wide-set, golden to copper coloured eyes, and medium sized, broad and slightly rounded wide set ears. The coat texture is fine, short, satiny and tight to the body. Bombays require little grooming. Petting will keep the coat shiny and free of dead hair. A rubber brush can be used for excessive shedding. A nutritionally complete food will add gloss to the coat and fuel for the cat's natural energy. Instant lap cat, best describes the heat-seeking Bombay lifestyle. Both sexes make excellent pets. While they will get along with other breeds, the Bombay usually wants to dominate other cats. A dog might make a good companion for a Bombay. These are smart and agile cats, they often retrieve and will seek out interaction with humans. Visitors' purses or packages are thoroughly inspected. Head bumpers and nose rubbers, they love nothing more than to be held. Some can be very talkative and they have a distinctive voice. Quiet, sensitive, reserved and intelligent, the Bombay does best in a quiet home, where it is affectionate to the whole family.